Blu-ray playback, 1080p resolution, oh... and it's a PC too! Silicon Mountain understands that times are hard at the moment, so consumers may not have the cash to buy all the different technologies they need. 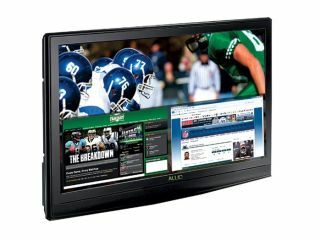 To help, they have gone and created the ultimate hybrid TV, which houses both a Blu-ray player and a PC. The 42-inch Jack of all trades has been called Allio. The PC that's squeezed into the telly comprises an Intel Core 2 Duo E8400 CPU, 4GB of RAM, a 1TB hard drive and Windows Vista Home Premium. The 1080p panel is just as impressive, featuring a 2,000:1 contrast ratio, 400 cd/m2 brightness and two 12-watt speakers. There's also the ability to watch your Blu-ray content as Picture-in-Picture or split-screen, but we're guessing you would have to have eyes that work independently of each other to truly enjoy these options. And that's not all, Silicon Mountain has found space to add a blu-ray player. Clever people. The TV is available now for $1,500 (£950) for the 32-inch version and for the bells-and-whistles 42-inch version, you'll be looking at forking out $2,799 (£1,800). If this is to pricey, do not fear as the company will soon be offering an Ubuntu alternative. There's no word if and when the HDTV/PC will hit the UK.